Not in Puerto Viejo or on the Caribbean side of the country but in the central valley and on the pacific side the rains have been terrible – most say the worst they have seen in years and years. The current storm is evidently the result of tropical storm Tomas which is centered in the Caribbean Sea. But the rain has been relentless for the past three months in the central valley and the pacific side and this storm just was the “straw that broke the camels back”. The country is in a declared state of emergency and they are reporting that 20 people have died in a suburb of San Jose (Escazu) and at 10 more are still missing. Roads and bridges are washed out all over the country and shelters have been set up for the hundreds that are being evacuated from their homes. Many homes have been lost to the flooding in all areas of the country (except the Caribbean side). 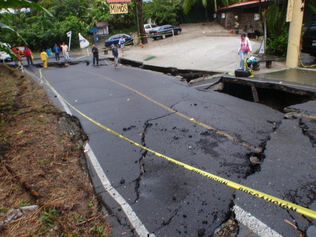 The picture to the left is of a road between the town of Manuel Antonio and Quepos in the southern pacific. We are leaving the country on Tuesday morning to fly back to the U.S. to pick up our paperwork to apply for residency here in Costa Rica. I sure hope that we are able to get to San Jose and that the planes are flying.